Safe Sanctuaries is an overt expression in making congregations safe places where children, youth and vulnerable adults may experience the abiding love of God and fellowship within the community of faith. 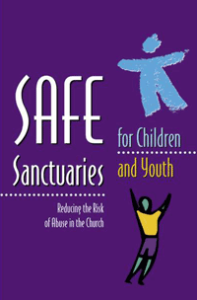 Providing Safe Sanctuary is the goal of all of our ministry settings. These policies and procedures are aimed at ensuring children, youth and vulnerable adults are kept safe from abuse while they participate in the life of the church in its many settings. First adopted in 1997, it is updated periodically to maintain excellence. The policy for all District and Conference level ministry is to have a Safety Advocate identified and present. This person has undergone a Safety Advocate specific training, has had a background check done, and enters a self-disclosure covenant. Other adults serving in leadership roles are also screened with background checks as well. Local churches are responsible for adopting and maintaining their own Safe Sanctuary policies. Below you will find the Conference policy, a background check form and a other helpful resources. If you have any questions, please contact Brant Henshaw in the treasurer’s office. Several files require a password for access. Please contact Brant Henshaw or Teri Tobey for the current password to request access. The Pacific Northwest Conference has contracted with MinistrySafe to provide a single dashboard for abuse awareness training and national background checks. If you need a copy of the step-by-step instructions to use and or get set up with your MinistrySafe dashboard please contact Teri Tobey. If you have questions about the MinistrySafe system or background checks please see our Frequently Asked Question page or contact Teri Tobey. On the Resource Tab of your MinistrySafe Dashboard you will find sample local church policies as well as staff and volunteer application and screening forms.